haha this page is adorable! Love it~ The sketch for the first book cover looks pretty cool too. Yep. 😉 Coal did mention it was his best tunic. It wasn’t everyday wear but you want to go into Valhalla looking as good as you can! Oh my god! Dat panel two-so frickin’ cute! Haha! The boys are super happy to have someone to badger. Its better then if they attacked all their visitors. My god they are so cute. I love how they think Coal´s eyes are weird. 😀 No wonder, though. Afterall, both their and their father´s eyes are different from his. The most lovely boys ever! Haha, that they are. Certainly eager. His eye’s, what about their eyes, Like deer caught in headlights. I’m surprised, they’re not pointing out his beaver teeth. They are the cutest! And actually they probably will be the cutest until Arne shows up. Happy New Year, how do Norse celebrate the New Year. Happy New Year! And I don’t know much about how the Vikings might have celebrated, though I’m sure they had solstice parties. XDD Loving Loki’s kids so far. Thank you! They have their father’s personality mostly. 😀 Except perhaps less mean. Just stumbled upon your comic today, and i must say, greatly enjoyed looking through the story so far. Very unique art style you have, and I am very interested by the story, keep up the awesome work! 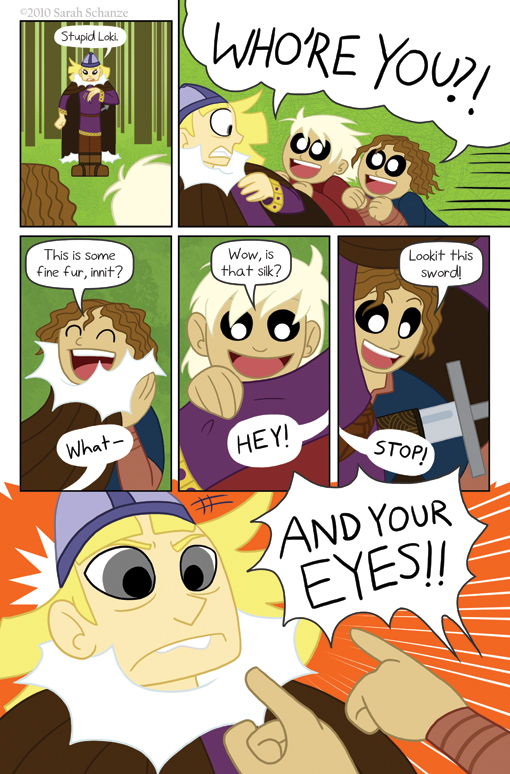 Kids, you do NOT touch someone’s sword without their permission. That way lies fatal misunderstandings. Good advice. *sage nod* If only Narvi and Vali would follow it. you do cute so well, i’ll bet even fenrir will look cuddly while he is eating the world. lol! Hahaha, thank you! XD I guess we’ll see when that big ol’ wolf shows up.